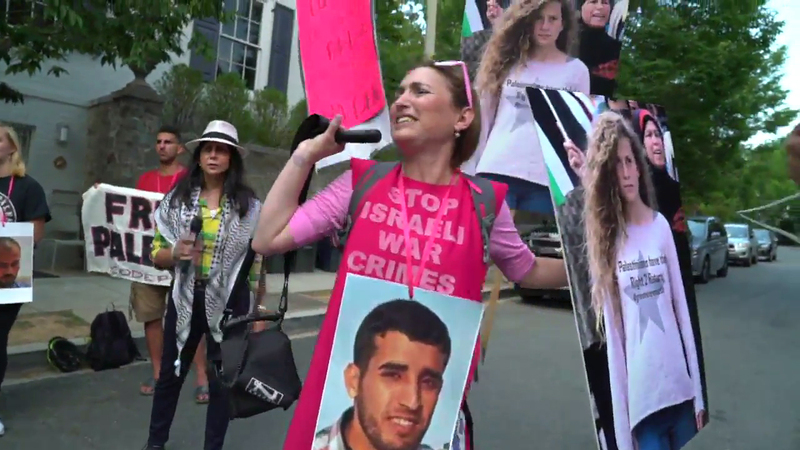 Code Pink Tells Jared Kushner "Palestine is Not for Sale!" "His proposed peace plan will not achieve peace if it gives away Palestinians’ right to Jerusalem and does not include the essential right of return or an end to the siege. This rally is also in response to a call by the Gaza Great Return March for activists around the world to take action in solidarity with Palestinians’ right of return. Since the start of the Great Return March, over 135 unarmed protesters have been killed and more than 14,000 wounded by the Israeli military, including children, medical staff, journalists, and the disabled. The group is assembling at Jared Kushner’s home in anticipation of the release of his peace plan. “We want to say that any peace plan must include the right of return, an end to the siege on Gaza, and an end to the Israeli occupation. Kushner should know that Palestinians can’t be bought out with cash; Palestine is not for sale,” says Nora Burgan, a Palestinian American organizer with the Ad Hoc Committee on Palestine. "